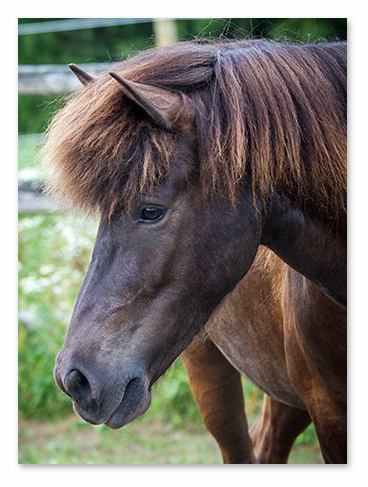 Þoka (“fog or mist”) is an elegant black/brown young mare. Her color changes with the seasons from deep black to milk chocolate brown and every shade in the middle. She is still young, but quickly becoming an exceptional riding horse. This is no surprise coming from two excellent first prize parents. Like all Kalman’s offspring Þoka is extremely beautiful with light, dancing movements. She has lots and lots of tolt, and takes big, wide steps. She offers tolt readily to her rider and she is becoming a tolting machine just like her mother Sædís. From her first rides she easily offered walk, trot, tolt, and canter. Pace may be available, but has not been trained yet. She is very supple through her body and light in the bridle. Her character is a sweet as they come. She always seeks to please and is an eager learner. She is willing to work hard for her rider in the ring or out on the trail. To top it off, Þoka's genetics provided her with excellent conformation. In the fall of 2013 Þoka was formally evaluated by FEIF International Breeding Judge Barbara Frische. Barbara found Þoka to be a “good girl” always watching positively and waiting for cues for what to do next – very expressive and cooperative, with perfect sensitivity. Þoka received excellent conformation marks for her straight facial profile, high set neck, sloping shoulder, correct legs, strong hooves, much mane and tail, and very good proportions. In movement Þoka showed lots of very supple tolt, great supple trot, nice canter and walk with high neck carriage and great balance. Barbara thought that Þoka was four gaited, but might be possibly four and a half gaited (similar to her dam with a little flying pace) but that her strongest gait would probably be tolt with good gait separation. So far, Barbara’s predictions are spot on! We are proud to announce that due to the terrific evaluation she received Þoka was ranked the 9th highest evaluated young horse of 2013 out of approximately 60 other young horses! 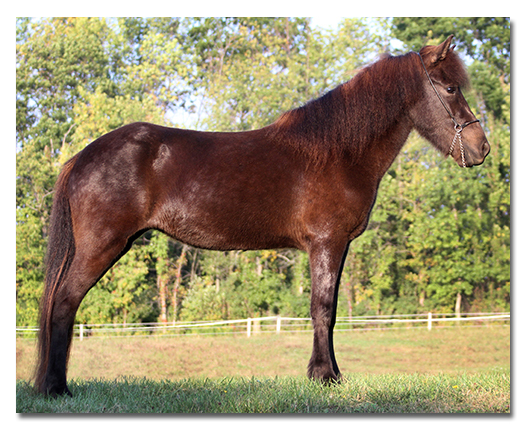 This is an excellent result – especially for a four gaited horse. We are very happy to have her join the ranks of our other super riding and breeding horses! To view many more photos and video of Þoka please visit her photo album. For more information on Þoka please contact us.